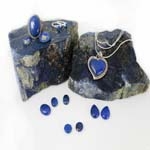 These unique jewelry peices are set with Lapis Lazuli (sometimes abbreviated to lapis). This rare, semi-precious gemstone is prized for its intense blue color. Lapis lazuli has been collected from mines in the Badakhshan province of Afghanistan for over 6,000 years. This stone can be traced back to the trade's of anceint kingdoms such as Eqypt and the Sumarians. Noa Sterling silver Ring with Lapis Lazuli and White CZ, Dimensions: 25.70 hight x 21.10 width mm..
Noa Sterling Silver Ring with Lapis Lazuli, Dimensions: 27.70 hight x 22.30 width mm.,Oval 24x20 ..
Noa Sterling silver Ring with Lapis Lazuli and White CZ, Dimensions: 27.10 hight x 24 width mm.,O..
Noa Sterling silver Ring with Lapis Lazuli, Dimensions: 28.40 hight x 22.50 width mm.,Baguette 20..
Noa Sterling silver Ring with Lapis Lazuli, Dimensions: 23.60 hight x 20.60 width mm.,Heart Shape..
Noa Sterling silver Ring with Lapis lazuli, Dimensions: 29.40 hight x 22.60 width mm.,Oval 12 x 9..